Wow! 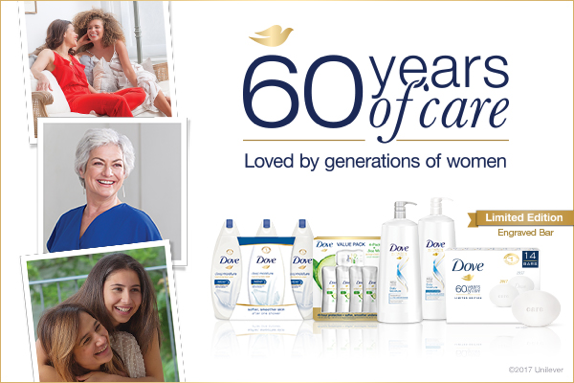 Can you believe that Dove has been caring for women for 60 years? It’s true. This tradition began with the Dove Beauty Bar, pioneered first of its kind in cleansing technology, in 1957 and the formula has remained unchanged ever since. As a child my mother would load up on Dove soap bars for our house and when it was time to take a trip to Mexico she would take some to my aunts and cousins. I always felt a bit fresher with the white bar and the rose bar. lol Silly of me, but in my mind I felt a bit more fabulous. I love how much it suds up in my wash cloth and lathers my body - the original white scent is my favorite. Today, as many of you may already know, this classic beauty bar is accompanied with a wide array of other amazing personal care products. One of my latest Dove obsessions right now is with the New Advanced Care Antiperspirant, which gives me 48 hour protection and I am super picky about my under ams but this I totally recommend. As a busy momtreprenuer, I like to shop in bulk, especially for my every day items, that would cause havoc if I don't have any...thats where Sam’s Club comes into play, you’re able to stock up on Dove items you love at a price you can’t beat! We lived inside Sam's Club growing up...I think #HTownKid loves it too! What's your favorite Dove scent, Do you have a Dove memory?